Amitabh Bachchan & Kishore Kumar - one cannot really imagine the voice of Amitabh as anyone else. They went together as well (or better) than Dev Anand/Kishore or Rajesh Khanna/Kishore as THE voice that pops into your mind when you think about a particular actor. So well suited was Kishore's voice for Amitji that I remembering having spirited discussions (spirited for a 13 year old at least) with friends who insisted that it was Amitabh singing the songs, years before he began to do so. And perhaps I would not have been as big of an Amitabh fan if some other singer had done his playback singing. I can count on one hand the movies in which Kishore did not provide playback for an Amitabh movie during the 70's & 80's. It was an amazing run where one's popularity just fueled the other's and resulted in both of them reaching unprecedented success in Bollywood. Kishore deliberately sang one octave deeper when he sang for AB & slightly changed his pitch when he sang for other actors - just another piece of the genius that is my favorite singer of all time. The video below is from one the earliest movies that Kishore was used as playback for Amitabh in the film 'Bombay to Goa' - the exuberant energy of this song is incredibly infectious and most likely will lead to random dancing with a big smile on your face - Dekha Na Hai Re. Yeah, Kishore Kumar is great! Are you going to talk about him in the 80's. I just posted Namak Halaal on my blog, Parties, Sarees and Melodies. Anyway, nice blog. 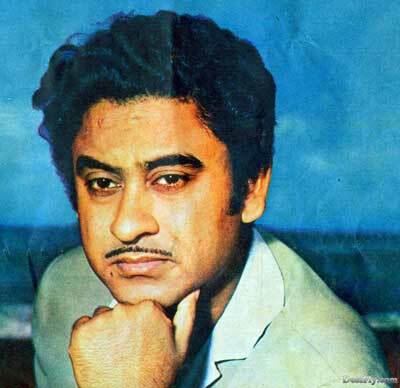 Kishore Kumar had entertained the viewers with his multi-talented singing style for more than 30 years. Within that span he was specially indebted to RD Burman who had given him immortal tunes. 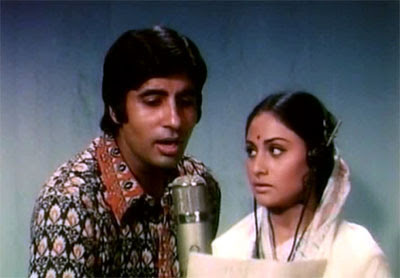 The Kishore-AB combination hit a peak with Yaarana where Kishore lent a "different" voice to Amitabh for each of the songs Chhookar Mere, Tere Jaisa, Saara Zamana, Bhole O Bhole and Tu Rootha. 'Yaarana' is one of my favorite soundtracks of all time. Kishore was simply amazing in it as his voice did change in the songs - as Amitabh's character became more 'trained' - Kishore's voice became less raw and more refined as well.